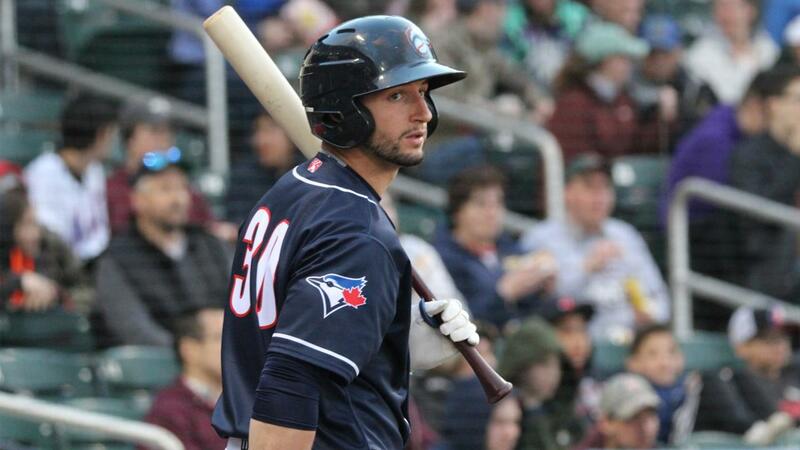 HARTFORD, CT - The New Hampshire Fisher Cats were outslugged by the Hartford Yard Goats 9-6 Saturday night at Dunkin' Donuts Park in a game that featured five home runs and a combined 18 hits. For the second consecutive night, the 'Cats struck first. Santiago Espinal began the game with a single and later scored when Albeto Mineo laced an RBI knock to right field. Leading 1-0, New Hampshire saw its lead evaporate in the bottom of the first. Starter Yennsy Diaz (L, 1-1) was roughed up for four runs on four hits, three of which were home runs. He would go on to tough it out for five innings. The 'Cats made it 4-3 in the top of the second thanks to a Chad Spanberger solo home run and an RBI sacrifice fly from Kacy Clemens, but another dinger from Hartford in the bottom of the inning - a two-run shot from Bret Boswell - returned the Yard Goats to a three-run advantage. New Hampshire made it interesting in the seventh. Trailing 8-3 at the start of the stanza, Spanberger started things with a walk. Vinny Capra singled to put two on for Brandon Grudzielanek, whose infield single up the third base line forced an errant throw and allowed a run to score. Clemens followed with an RBI base hit and Forrest Wall did the same two batters later to make it 8-6 Hartford. The Yard Goats plated an insurance run in the bottom of the seventh and would go on to win 9-6. Alberto Mineo logged multiple hits for the second consecutive game and fourth time this season. Chad SPanberger's second inning home run was the first of his DoubleA career. Ty Tice worked a perfect eighth inning. The 'Cats and 'Goats finish their four-game series Sunday afternoon at 1:05 p.m. RHP Andrew Sopko will toe the slab for the Fisher Cats against Hartford's Ashton Goudeau. Coverage begins at 12:45 p.m. on the Fisher Cats Radio Network.